I've been pretty lucky with my copies of Liane Moriarty's books. Finding them at bargained prices or on kindle sales makes me pretty happy. It's great because her books are great. I'm thoroughly enjoying this new-to-me-author and all she has to offer. Alice Love wakes up on the gym floor after falling off her stationary bike during spin class. Only she's certain she doesn't know what spin class is and that she's pregnant with her first child...oh, and that it's 1998. Fortunately for Alice she's got a loving and supportive family to help her through everything. Just kidding, that wouldn't make for a very interesting book, would it? 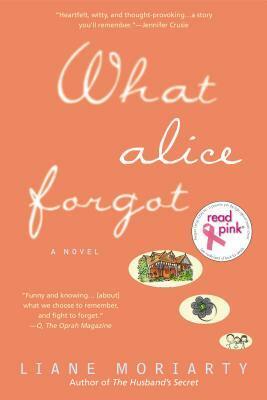 Alice does have an intricate web of a family, only she doesn't really know them anymore. She doesn't know her outspoken mother, her estranged husband, cynical sister, and she definitely doesn't know her three children. I liked this book for a lot of reasons. First off, 2008 Alice sounds like kind of a drag. I liked seeing her discover new things about herself and share her old self with others. Her old self was kind of fun and silly, but it seems like things changed when she met Gina. Gina is a mystery for a while until Nick, the estranged husband, starts to speak up. I feel like this is a great tale of rediscovery. It was kind of long and parts of it dragged, but all-in-all this was a good, attention-keeping read.